Over the last year or so, my focus has been providing bite-sized nuggets of info to help make using GP easier and more productive. I'd now like to take a turn to something that is near and dear to my heart - training. In my experience, most GP (or any software app for that matter) users are seriously under-trained in the finer points of the application. An ongoing program of training can do so much to unlock additional productivity and make a user's experience much more satisfying. So, for the next few months, I want to encourage users to take advantage of the many, many opportunities that exist to get more out of GP and make their work-a-day lives easier. And in this first installment, I want to introduce GPUG to users who don't know what it is or what they offer. GPUG (the Great Plains User Group www.gpug.com) is an organization 100% dedicated to improving the Dynamics GP user experience. 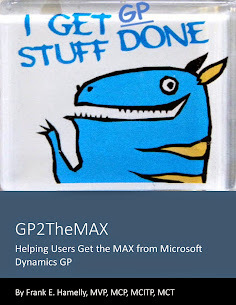 I recently joined GPUG and cannot believe how many different programs they offer to help the GP user improve their understanding of and proficiency in Dynamics GP. Not only that, but as a community of users, there are tons of ways to connect with other users and share experiences. GPUG has only been around since 2006 but has seen significant growth and reach since then, with 20 regional chapters throughout the U.S. and Canada. To that end, I want to do what I can to help GPUG fulfill its mission. I'm going to go to my first GPUG regional meeting this week in Atlanta. I'll blog about the experience later this week. In the meantime, I encourage you to check out their website and see if GPUG would be a good fit for you.